An 80-year-old man is having his annual checkup. "I've never been better!" he replies. "I've got an 18-year-old bride who's pregnant and having my child! What do you think about that?" The doctor considers this for a moment, then says, "Well, let me tell you a story. I know a guy who's an avid hunter. He never misses a season. But one day he's in a bit of a hurry and he accidentally grabs his umbrella instead of his gun." "So he's in the woods," the doctor continues, "and suddenly a grizzly bear appears in front of him! He raises up his umbrella, points it at the bear, and squeezes the handle. The bear drops dead in front of him, suffering from a bullet wound in his its chest." "That's impossible! 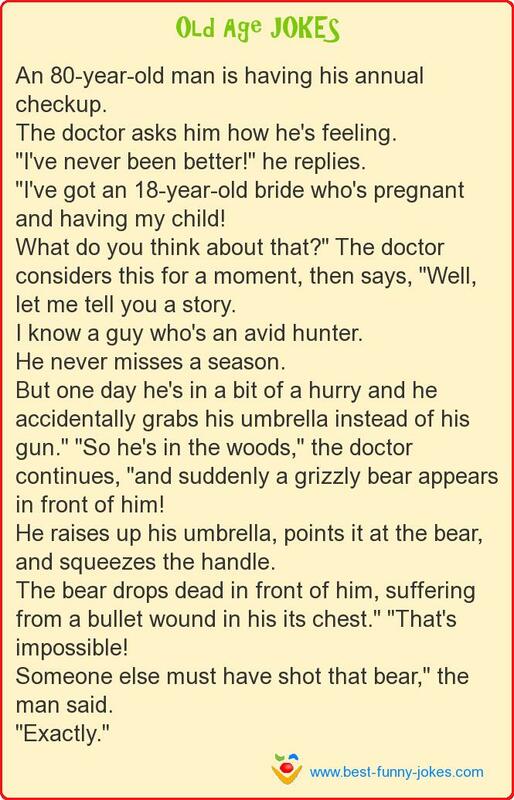 Someone else must have shot that bear," the man said.